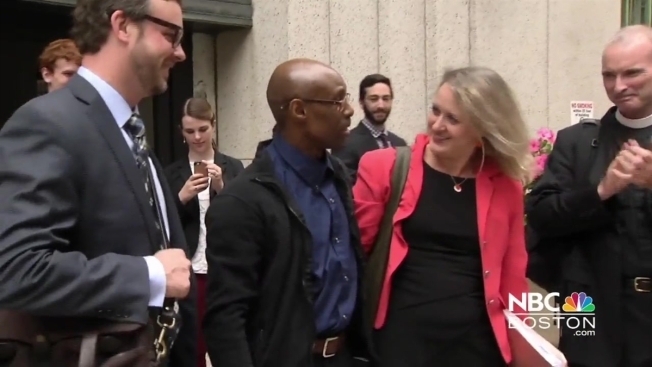 A man who was wrongly convicted of killing a Boston cab driver was released on Tuesday after spending nearly four decades in prison. Suffolk County District Atorney Daniel Conley's office filed a nolle prosequi, ending further prosecution of Frederick Clay after a reinvestigation by his office found that justice might not have been served. "I lost 38 years of my life for something I didn't do," Clay said in court Tuesday morning. Clay was just 16 when he was charged with first-degree murder in the 1979 shooting death of 28-year-old taxi driver Jeffrey Boyajian in Boston's Roslindale neighborhood. He was convicted in 1981 and sentenced to life without parole. "I've been locked up since I was 16 years old and now I'm 53," Clay said. "There's a lot of life I gotta make up for and a lot of things I gotta learn." A second man was also charged in connection with the murder, while a third man who was allegedly involved was never apprehended. A witness testified during the murder that he saw Clay shoot Boyajian, but Clay has maintained his innocence, saying he was at a foster home at the time. Clay's attorney said Tuesday that there were errors with the witness identification and that "justice was not served." Conley said some of the witnesses in the case were hypnotized to enhance their recollections before identifying Clay as a suspect. That once-common practice has since been largely discredited. "As a prosecutor, my duty is to justice, not a conviction," Conley said. "Given what we know today, that duty was best fulfilled by affirmatively ending any further proceedings against Mr. Clay." Family members of Boyajian said they supported the decision to have Clay's conviction vacated.